Abstract. The central importance of soil for the functioning of terrestrial systems is increasingly recognized. Critically relevant for water quality, climate control, nutrient cycling and biodiversity, soil provides more functions than just the basis for agricultural production. Nowadays, soil is increasingly under pressure as a limited resource for the production of food, energy and raw materials. This has led to an increasing demand for concepts assessing soil functions so that they can be adequately considered in decision-making aimed at sustainable soil management. The various soil science disciplines have progressively developed highly sophisticated methods to explore the multitude of physical, chemical and biological processes in soil. It is not obvious, however, how the steadily improving insight into soil processes may contribute to the evaluation of soil functions. 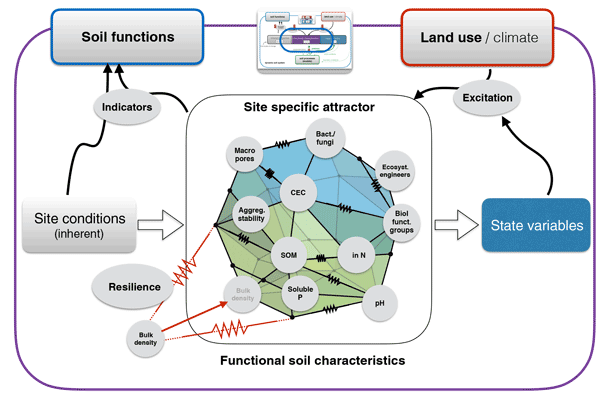 Here, we present to a new systemic modeling framework that allows for a consistent coupling between reductionist yet observable indicators for soil functions with detailed process understanding. 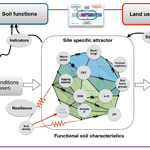 It is based on the mechanistic relationships between soil functional attributes, each explained by a network of interacting processes as derived from scientific evidence. The non-linear character of these interactions produces stability and resilience of soil with respect to functional characteristics. We anticipate that this new conceptional framework will integrate the various soil science disciplines and help identify important future research questions at the interface between disciplines. It allows the overwhelming complexity of soil systems to be adequately coped with and paves the way for steadily improving our capability to assess soil functions based on scientific understanding. How to cite: Vogel, H.-J., Bartke, S., Daedlow, K., Helming, K., Kögel-Knabner, I., Lang, B., Rabot, E., Russell, D., Stößel, B., Weller, U., Wiesmeier, M., and Wollschläger, U.: A systemic approach for modeling soil functions, SOIL, 4, 83-92, https://doi.org/10.5194/soil-4-83-2018, 2018.